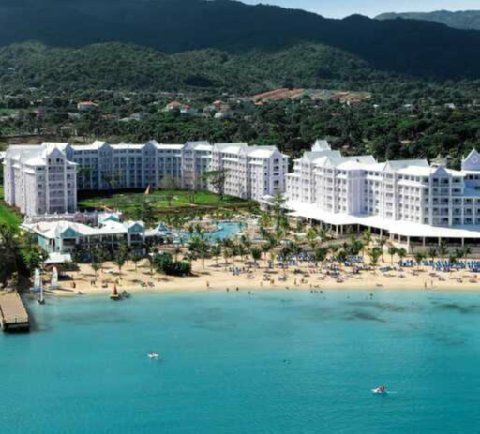 This brand new property is surrounded by lush tropical gardens .. unspoiled beaches and sapphire waters .. Riu Ocho Rios All Inclusive Resort is a tranquil destination for couples looking for a romantic seclusion or vacationing families visiting Jamaica. Guests can choose to remain at the resort and enjoy complimentary access to three pools .. tennis .. beach volleyball and use of a wide range of non-motorized water sports equipment. Golf enthusiasts can test their skills on several beautifully maintained area courses. For those who wish to experience first hand .. the rich coral reefs and colorful marine life that abounds in the waters of the exotic offshore islands .. professional scuba diving instruction and certification is available outside the resort. The multilingual staff of Riu Ochos Rios All Inclusive Resort pampers guests with a full service health spa .. beauty services and massage treatment rooms. Guests can dance the night away at Pacha Disco or choose from several other resort planned activities. Catering to children .. the family friendly resort offers supervised childrens activities and features a playground and separate childrens pool. With five restaurants onsite .. resort guests can choose from a variety of cuisines and dining atmospheres. The 846 guestrooms of Riu Ocho Rios All Inclusive Resort have a Classic European flair with oak wood furnishings and choice of king bed or two doubles. All guestrooms feature satellite television .. a liquor dispenser .. a minibar and a balcony or a terrace. Select guest suites offer adjoining living rooms with sofa or tubs with hydro-massage. Whether celebrating the start of a new life together .. commemorating the decades of happiness or sharing the family moments in between .. Riu Ocho Rios All Inclusive Resort marks the event with comfort and endless Jamaican sunshine. Taxes included in the rates.Check-in time after 3 p.m.Check-out time before 12 p.m.Rates subject to change.Children under 2 years stay free when sharing with parents. Children 2-12 years of age pay 50 percent of the adult rate as long as the child is sharing the room with 2 adults. If it is just one adult and one child .. the child will pay full adult rate. Children 13 years and older pay adult rates. Minimum Age for check in at Riu Hotels is at least one person of 21 years or older in every room - NO student groups under 21 years or SpringBreakers are accepted all year round. During March and April the Hotel reserves the right of admission and therefore we may not admit any room in which all guests are younger than 21 years. - This situation can have serious consequences and should be avoid it at any cost Pets are not allowed.